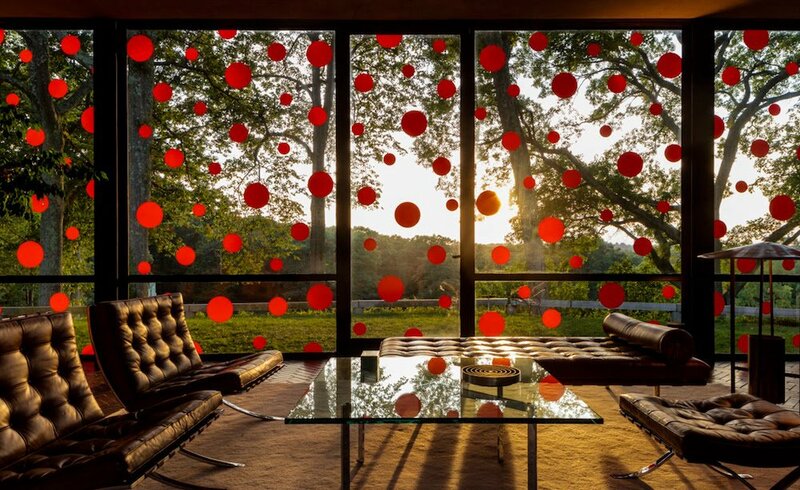 ‘Dots Obsession’ is the latest site-specific installation at the Philip Johnson Glass House by Yayoi Kusama. 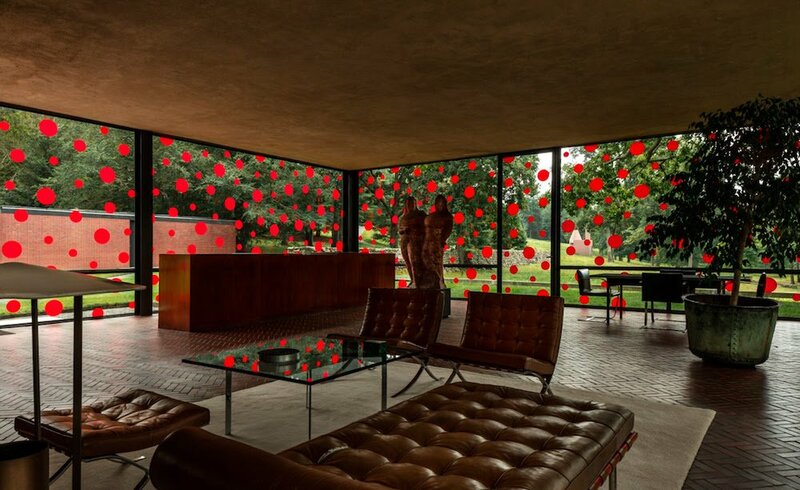 The Glass House by Philip Johnson, covered in the signature dots of Japanese conceptual artist Yayoi Kusama. The Japanese Conceptual artist Yayoi Kusama’s preoccupation with dots. 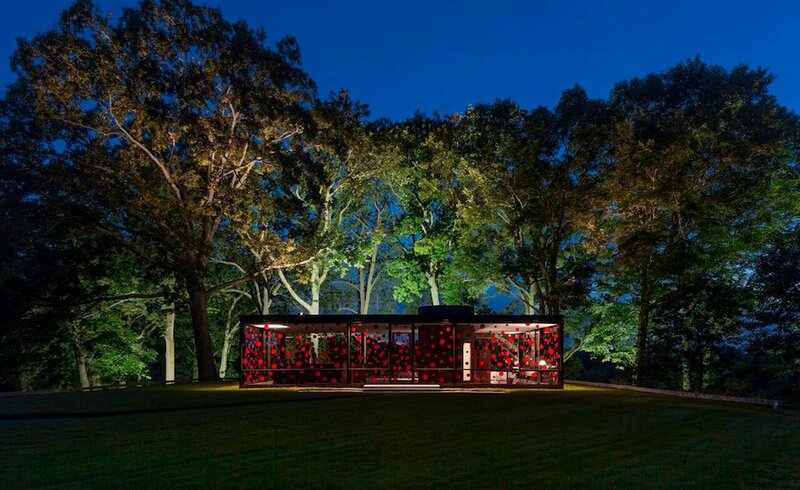 It has been whimsically projected onto a legendary Mid Century icon: Philip Johnson Glass House. Know more about Artist Leng Jun Paintings Detail Only View By Magnifying Glass. 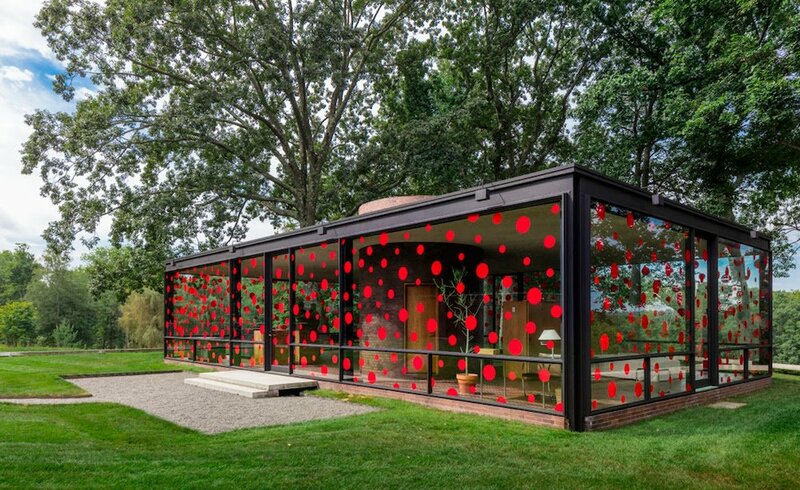 Philip Johnson Glass House with Dots Obsession. Marking the occasion of what would have been the architect’s 110th birthday this past July. Kusama has bedecked the entire exterior of the house with an arrangement of her signature red dots. Dots Obsession is Alive, Seeking for Eternal Hope, an installation. Which open on September 1, will be on view only through September 26th. Completing a trio of site-specific Kusama works on the property, dating back to the spring. The installation of Yayoi Kusama’s Dots Obsession was a long-distance affair. With the elderly artist dispatching a team from Japan to complete the project. Armed with vinyl red dots in 3 sizes, and exacting instructions from her for each dot’s placement. Applied piece by piece via scaffolding, the dots adorn the four glass sides of the house. Including its doors, turning Philip Johnsons Glass House into, appropriately enough, a gaily wrapped modernist gift. Yayoi Kusama has decorated everything, from department store windows to clothing to George Clooney, with her dot compositions. But few of her canvases (Clooney include) have as famous-for as long-as Johnson’s iconic Glass House, completed in 1949. 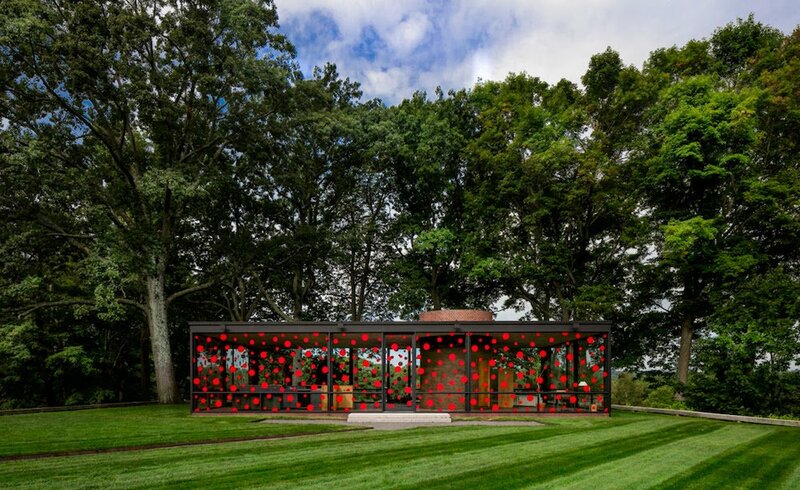 Arranged in a very specific pattern, three different sizes of vinyl dots cover the exterior of Philip Johnson’s Glass House. Yayoi Kusama’s Dots Obsession installation on the Glass House lasts only through September 26th. Photographed at night, Yayoi Kusama’s signature patterning on the Glass House. At 87, the once reclusive Yayoi Kusama has never been more prolific. Feted with retrospectives at the world’s most famous museums. Including London’s Tate Modern and New York’s Whitney Museum of American Art—over the last decade. New Smart Home Lighting Fixtures. Best metal wall art design ideas. Of her most famous motif, she has said. ‘A polka-dot has the form of the sun, which is a symbol of the energy of the whole world. And our living life, and also the form of the moon, which is calm.